The quality of the sun lamp truly determines the efficiency of all tanning systems, customer satisfaction and the entire tanning salon operationís success. It is critical to choose the right tanning lamp to perfectly complement the tanning system used in the business. Supra Brands' wide range of low and high pressure tanning lamps is designed to suit the needs of all tanning systems worldwide with the reliability and superior performance in mind. Value and Performance meet here. For 25 years our undisputed know-how in the field of UV-Technology, combined with lamp production and state of the art equipment design, complement each other perfectly. To ensure maximum performance, both ambient and operational issues have been researched, understood and then designed into all product segments. The complete range of high and low pressure lamps perfectly complement all tanning system manufacturers and operators to equip their products with this wide range of high performance tanning lamps. Excellent tanning performance due to the highly efficient spectral range characterized by the proprietary metal-halogenide mixture. Use of only high quality components such as quartz glass, electrodes and gas mixture are complemented by a rigorous control system to ensure legendary quality and performance. The most efficient lamps with the most even performance through the lamp's useful life. Designed for perfect system integration of filter glasses, reflectors, ventilation and comfort for the end user. For many years, and too often today, the simple reference of UVB percentage/content has been the only issue manufacturers and salon operators have discussed. 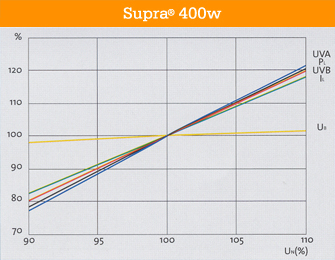 It is important to understand that the supply voltage, the actual current in watts, as well as the ratio of UVB to UVA is an integral part of the tanning unit's performance. 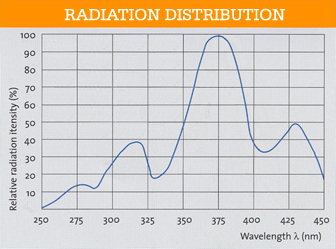 In addition - and herein lies the secret truth: The performance of a tanning lamp is measured in mw/cm≤, and one must measure both the peaks amplitude and where on the nanometer scale the UVB and UVA peaks are, in order to properly ascertain a lamp's peak bronzing ability. All lamps are not created equally. 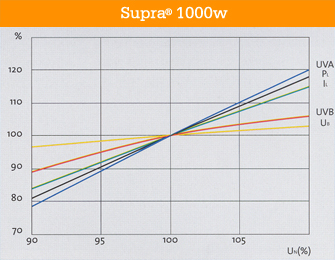 The diagrams below show characteristics of two lamps, a 400w and a 1000w, measured in an ambient temperature of 104F. 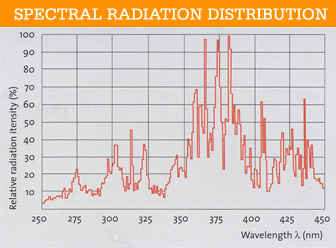 Radiation flux: UVA 320-400 nm; UVB 280-320 nm; PL: Lamp Power, IL: Lamp current, UB: Operating voltage, Un: Main voltage. 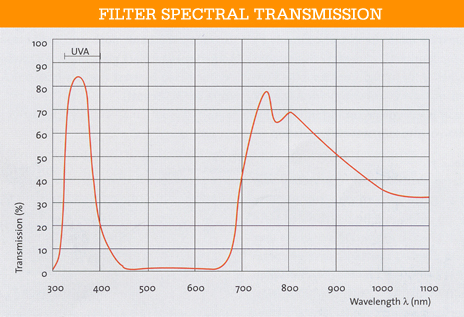 Spectral transmission curve of a frequently used filter (UVISOL '95). A few examples of other filters for UV applications are M-UG2, M-UG4, M-UG6, and Type322. More recently several types of coated (filter)glasses have been introduced that more effectively, and with lower wattage, afford a better tan faster.